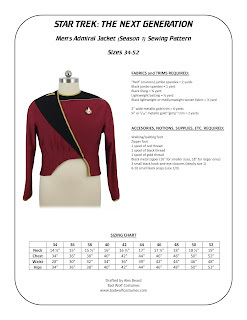 Men's TNG season 1 admiral pattern, Pre-order discount! Our new men's TNG season 1 admiral pattern is now available for pre-order, at a 10% discount! Patterned directly off an original, screen-used admiral uniform we examined, our pattern features authentic paneling, proportions, and hidden zipper closure! Men’s sizes 34-52 are all included. Pre-order your copy today at a 10% discount! It will begin shipping on Monday, February 4, at point it will be listed at regular price. Subscribe to our e-mail newsletter (upper right corner) for updates!